When registering at Freenet.am you will get only an E-mail Account by default. If you also want to have a Personal Web page at Freenet.am, you should go to "My Freenet" section, where you will find and easy way to Open (Activate) a Personal Web page at Freenet.am. Personal Web page activation is one-time procedure. After that you will be able to enjoy your Personal Web page. In fact activation procedure involves only creation of a special folder (public_html in your home directory) that you are not allowed to do yourself. where username is your Freenet.am Login. a special folder (public_html in your home directory) using Freenet.am SFTP access. Note, that creation of your Personal Web page is possible only via "My Freenet" section, while removal is possible only via SFTP access. If you already have a Personal Web page at Freenet.am, you can now manage (Copy/Delete/move/ etc.) the information at your Personal Web page. At Freenet.am this is done via SFTP secured protocol. SFTP is the only method Freenet.am users can use to transfer their webpage files from their local computer to their Personal Web page at Freenet.am. SFTP access at Freenet.am can be performed using a free 3rd party SFTP client software (WinSCP package). Download our pre-configured WinSCP package (ZIP archive). It contains ready configuration for Freenet.am SFTP access. 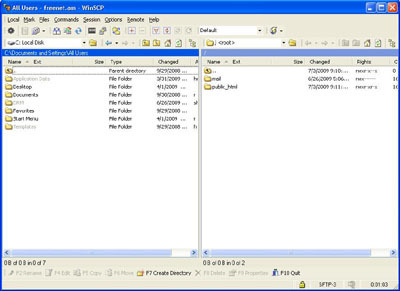 This ZIP archive contains one "Winscp419" folder with "winscp419.exe" and "winscp419.ini" files in it. All you need is to extract the ZIP archive somewhere on your local drive and run "winscp419.exe" file. It is not an install package, but a ready-to-run program. 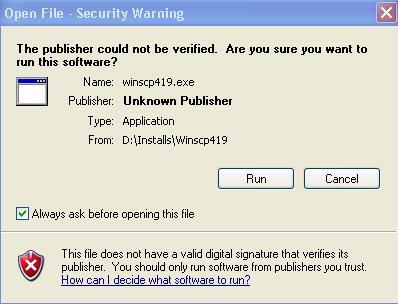 In case authentication process will succeed you will finally see WinSCP interface like below. Here your local hard drives are available at the left and your Freenet.am hosting is at the right side. "public_html" folder is the place where you can put your Personal Web page files. Now Feel free to manage (copy/delete/move etc.) your Personal Web page area and enjoy your Freenet.am FREE Webhosting service ! No. Freenet.am FREE Webhosting service supports only plain HTML pages.